Glasgow Punter: Chrysta Bell. Glasgow gig. 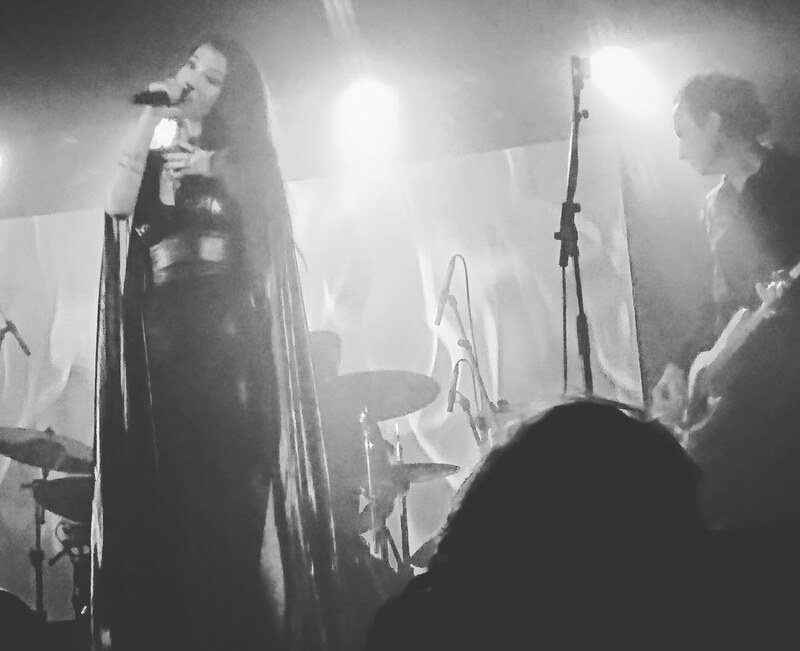 Brought to public attention by her role as special agent Tammy Preston in the latest series of David Lynch's Twin Peaks, Chrysta Bell seems a surreal presence on a chilly Spring evening in Glasgow. As a musician she has been performing since the 1990s and although her current tour is taking her all over the globe on the back of her recent acting turn for David Lynch, the audience for tonight's gig was on the rather meagre side. To compensate, the venue (Oran Mor) was set up with cabaret style seating, which lent an appropriately louche atmosphere to the gig. I think the polite way to put it is that Chrysta Bell Zucht's acting in Twin Peaks: The Return was divisive. In the world of David Lynch and Mark Frost it can be hard to tell if the appearance they were after intentionally was of a plank of wood. If that was the case then she nailed the character of Tammy Preston. Introduced with projected eery visuals and electronic twangs that would not sound out of place in a Lynchian dream sequence, Chrysta Bell slinks on stage and launches into 52 Hz, all echoing vocals and electric drum beats before battering straight into Devil Inside Me, more breathy vocals and melancholy. The night continues in the same vein, a coy "thank you" between songs and onward into another anthemic torch song. The three piece band are tight and well drilled throughout without ever setting the heather alight. An occasional twang of steel guitar lifts the music above the mundane. We are never far away from Twin Peaks though. The kaleidoscopic projected visuals, Chrysta Bell's vampish presence and the unsettling songs which could all fit snuggly into the Bang Bang Bar playlist (one song is even called Blue Rose in case you don't notice). There is also songs like Down By Babylon co-written by David Lynch. It's an engaging and slick performance, without ever appearing to get out of second gear. Many of the small crowd are here because of the Twin Peaks connections, which ultimately smothers any individuality from the concert. It felt like watching Jessica Rabbit covering some Chris Isaak songs, but then that just brings us back to Twin Peaks again. Isn't that right agent Chester Desmond? Glasgow International 2018 - Ah, but is it art?